"Meet The Original Force Of Nature"
“Dr. 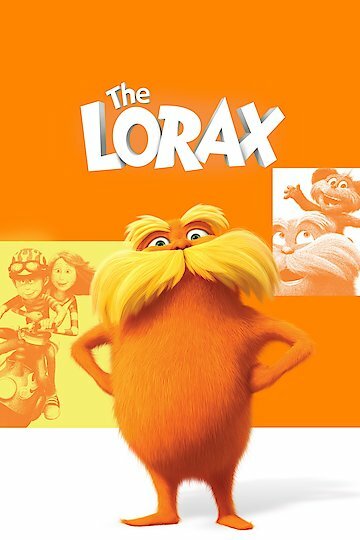 Seuss' The Lorax” is a computer animated movie based on characters in the magical world created by Dr. Seuss. It takes place in and around Thneedville, a town where everything from the trees to the breathable air is manufactured. Ted, a young resident of the town, has a crush on neighboring artist Audrey. In an attempt to impress her Ted embarks on a mission to show her a real tree. A mission hampered by Thneedville's diminutive corporate operator and owner, Mr. O'Hare. Mr. O'Hare makes the majority of his money selling fresh air to the citizens of the town. On the advice of his grandmother, Ted goes outside Thneedville to find the Once-ler amongst the ruin and desolation beyond the city wall. Over a number of visits Once-ler tells Ted his story about his attempt to change the world. The Once-ler encounters a beautiful valley full of happy animals, singing fish, and tall Truffula Trees. There he cuts down a tree and accidentally summons the forest's guardian, The Lorax. The Lorax threatens Once-ler if he, and his violent tendencies, don't move out of the forest. After a perilous float down the river, The Lorax agrees to let Once-ler stay. Once-ler wants to use the soft tufts of the Truffula Tree for his invention, the Thneed. A sudden increase in the popularity of the Thneed causes Once-ler to summon his family to help make more thneeds. This quickly leads to the destruction of the forest, despite Once-ler's previous promise to The Lorax not to cut down any more trees. A large manufacturing plant is eventually built, creating the desolation, destruction, and air pollution Ted knows. Once-ler's tale, and his success, end with the chopping down of the last tree and the departure of the animals. Ted is given the last Truffula Tree seed to plant in town. He must also plant the seed of concern for trees in the minds of the people. Mr O'hare is determined to prevent the planting of the seed since trees provide fresh air for free, putting a dent in his sales. A chase ensues that involves traffic, 5 gallon jugs, and a snowboarding grandmother. Dr. Seuss' The Lorax is currently available to watch and stream, buy on demand at Amazon, Vudu, Google Play, FandangoNow, iTunes, YouTube VOD online. Taylor Swift has a few choice words for the two funny ladies, whose Golden Globe joke about Swift's dating life did not sit well. Did Taylor Swift Steal Lyrics? Folk singer Matt Nathanson is on the receiving end of some bad press after claiming that the singer stole lyrics from his 2003 album. Taylor Swift Will Write Songs About You. Accept It. Taylor Swift admits that she wrote a song about an ex even though he asked her not to. Shocking. Taylor Swift on Taylor Swift. Taylor Swift opens up to Katie Couric about her struggles with love, and the songs that have come from her many heartbreaks. Will Taylor Swift Become a Kennedy? Will Taylor Swift's new relationship with Conor Kennedy blossom, and would a marriage finally enable the singer be able to put down her grueling, dirt-grubbing lifestyle and settle into high society and luxury? Wait. Taylor Swift is Single Again! Taylor Swift and her younger boyfriend, Conor Kennedy, have split. A friend says the break was on good terms. Looks like all that cross-promotion worked out: "The Lorax" took the box office by storm this weekend, outperforming "Project X" and breaking the record for a non-sequel animated film. Who knew? Get the full story here.